Cambodia has seen a decrease in malaria incidence and related deaths since 2009. 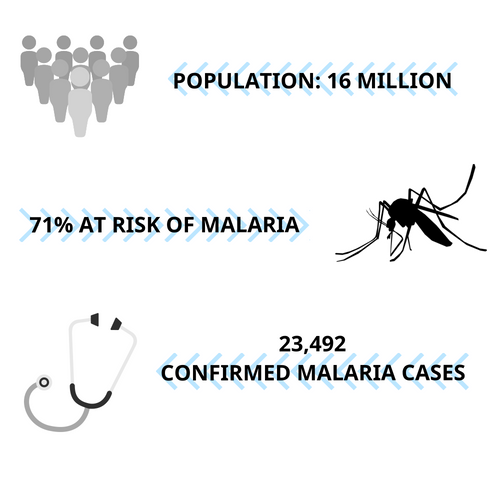 Although significant progress has been made, malaria still remains a threat due to increasing resistance to multiple anti-malarial drugs throughout the country and the Greater Mekong Subregion (GMS). Malaria in Cambodia predominantly affects adult men who move from regions of the country that have low areas of transmission to areas where malaria transmission is high.Cambodia’s highest malaria burden is in the north-eastern region of the country along the forested border, near Viet Nam, Lao People’s Democratic Republic, and Thailand. Mobile populations and artemisinin resistance are the main challenges Cambodia faces to reaching its malaria elimination goals. Artemisinin resistance refers to when the malaria parasites in an infected person’s blood stream take longer to clear one’s system following an artemisinin-based combination therapy (ACT) treatment. This resistance likely emerged in Cambodia and the (GMS) prior to 2001, and is a result of poor treatment practices, inadequate adherence to antimalarial regimens, and the widespread availability of substandard forms of oral ACT drugs. If not addressed, the scope and effect of artemisinin resistance could grow to become a global multi-drug resistance issue. Reducing the prevalence of malaria in Cambodia will mitigate the risk of multi-drug resistant parasites spreading outside the country and the GMS. The Strategy for Malaria Elimination in the Greater Mekong Subregion (2015-2030) urges immediate action and calls for the elimination of all species of human malaria across the GMS by 20130. With this directive, the Cambodian NMCP, donors and other vector control stakeholders are implementing plans to eliminate malaria in Cambodia. Antimalarial drug resistance in Greater Mekong Subregion: How concerned should we be?